Happy Spring friends! As I type this there is a blustery rain storm outside my window. A typical Oregon spring day. It's actually a odd juxtaposition I've gotten used to over the years. Spring flowers, longer days, trees leafing out and yet the cosiness of inside and shelter from the storms that roll in and out through the day. That being said, baking cakes and drinking copious amounts of coffee go quite well with this weather. This little cake would be perfect for any season. The kind of cake that makes you want to have your friends over on a lazy Sunday morning ( sigh...not that I have too many of those mornings), or you could invision the little hands of your children wrapped around a slice ( and all the buttery topping going all over the tablecloth you changed). It’s a choose your own daydream kinda cake! You could easily swap the fruit around, sliced pears instead of apples, blueberries, raspberries maybe even some rhubarb. 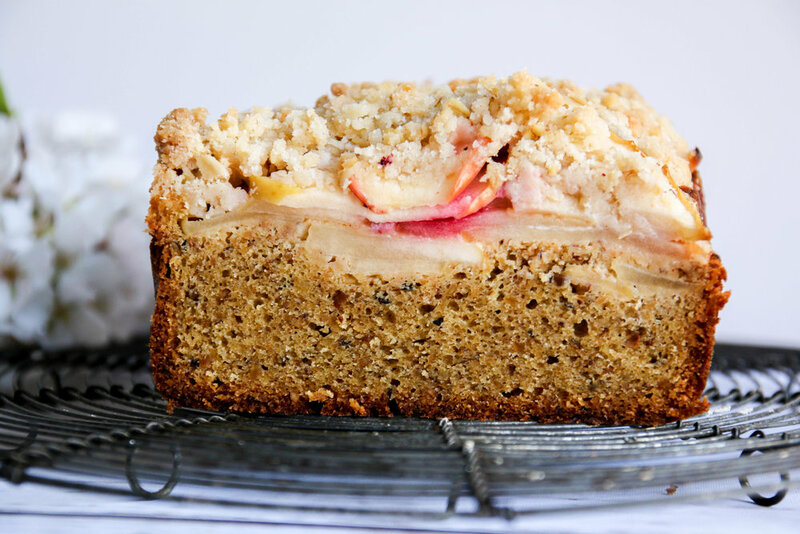 I love its rustic quality, the weight of the fruit sinking into the cake the buttery crumb topping. The one omission you shouldn’t make is the toasted ground hazelnuts, they are what take this gem of a cake to the next level of deliciousness. I toasted whole hazelnuts in the oven, then skinned them before grinding, you can also use ground hazelnuts and toast them in the oven. The preparation is simple so taking the extra time for the hazelnuts is really no biggie. Line the bottom and sides of a 9 by 5 inch loaf pan with parchment paper (I made a sling). Cut the apples into quarters, core them, then cut into thin slices. Squeeze a little lemon juice over them, then mix lightly with the blackberries. Combine the butter with the sugars in the bowl of a stand mixer and beat until light, smooth and pale in color. Mix the eggs lightly with a fork and gradually add them to butter/sugar mixture beating all the time. Sift the flour and baking powder together, followed by the ground hazelnuts, then add in two batches to the mixture. Transfer to the lined loaf pan. Scatter the apples and blackberries over the top and push some of the fruit lightly down through the mixture. Make the crumble by rubbing the butter into the flour, with your fingertips. Stir in the sugar, rolled oats and cinnamon. Scatter over the top of cake and bake for about an hour, until a toothpick inserted into the middle of cake comes out moist but relatively clean. Leave cake to cool completely before removing it from its pan.